Nice work, Pat. Very illustrative. It would be interesting to see a few more test cases for more complex sites to see if the 80/20 ratio holds. I'm with Eric: some more tests are needed to 'proof' the 80/20 ratio sticks. I'm gonna head over to the forum now to post my thoughts on how to improve the Webpagetest. Would be nice to differentiate the test results into ones that a server access is needed for and ones where its not. Also the cache-static test is I think a semi-questionable test for static websites. All basic content is auto-cached by default by browers, so the score given here is misleading. I would think it would be more relevant for forums, blogs, and all such heavily scripted site types. Sunja, not sure exactly what you're talking about. The check for static objects already ignores anything where the server explicitly says not to cache it (pragma:no-cache, etc) which will cause it to ignore dynamic requests. More often than not the only request that is truly dynamic is the initial request for the base page (and any ads). The rest of the requests are usually for static content of some kind (images, css, js, etc). While the browsers do CACHE all static content, if you don't set an expires header on the content the browser has to make a request to the server for each one of them to make sure it hasn't been modified, resulting in a 304 response. 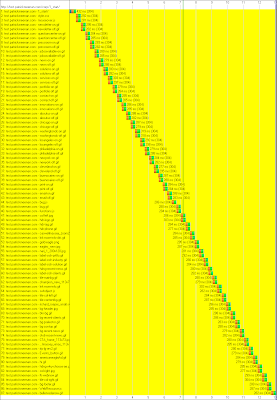 All of the "yellow" highlighted requests in the repeat view waterfall are for requests of static content that the browser had cached but that it still needed to check with the server to make sure it hadn't been modified. Eliminating those requests for repeat view users is critical to improving the performance because just the act of making the request to check to make sure it is up to date takes almost as long as downloading the content the first time. 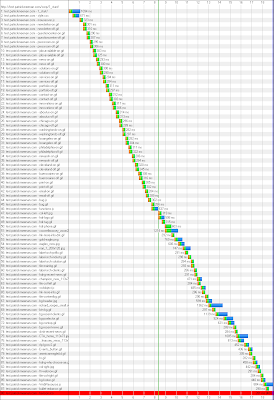 I'll pull stats when I aggregate all of the historical pagetest data but this is by FAR the most common problem people have with their sites and it applies to all types of sites - static pages, blogs, even web 2.0 apps. Ok, thanks I see what you mean about the cache expires header. I still think it would be good to separate or highlight those tests that require server access to fix and those that don't. I would say a large number of people don't have server access probably, and it would just be nice to be able to quickly see at a glance. thanks! What kind of "server access"? For most hosting accounts all of these can be fixed with a .htaccess file that you publish with your content (assuming apache hosting). That is the only level of access I had on the host I used for this testing.